The arguments for window replacement are: 1) it will save on heating and cooling bills and 2) it will increase the value of your home. However, the costs of window replacement can be high -- very high. The truth of the matter is that replacing windows makes sense as long as the old windows really need replacing and the new windows are of reasonable quality. Windows that truly need replacing - If balance ropes are broken or the insulation is coming off, these can typically be repaired for significantly less than the cost of replacement windows. However, if the sash (i.e. window pane) is rotting or water is leaking in, or if the seals are broken and hardware no longer works then the window may truly be failing. Shown above (left to right), a Marvin wooden bay window, a Pella wooden double-hung window, an Amsco composite casement window. 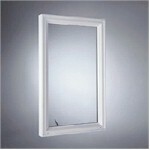 Replacement Sashes - These are windows in thin frames. The contractor pulls out the old sashes and balance ropes, then fits the new frame into the opening. The existing trim and siding is not removed. The glass area will be smaller to accommodate the replacement frame. This is the least expensive way to replace windows. Full-Frame Windows - These are other end of the window spectrum. The old window is completely removed. Then the new window is fitted into the gap between the exterior and interior walls and attached to a stud(s). To install full-frame windows would typically involve replacing the interior trim along with the window. Vinyl - is the least expensive type of windows. They offer good insulating values, but are often limited in their color selection. Aluminum - are the most durable windows. Historically, they have had poor insulating values, however, new technology with thermal breaks is beginning to address the issue. Wood - has the appearance and feel that most people prefer. However, they are they will eventually warp or rot if not maintained properly. Wood windows are typically the most expensive type. Fiberglass - has high strength, superior durability, and high energy efficiency. Fiberglass windows are typically as expensive as wood, but have much lower maintenance. Composites - new composites use resins and wood fiber to achieve some of the aesthetic benefits of wood windows while keeping the low maintenance aspect of vinyl. They are typically priced 10-20% lower than wood. However, their availability is limited. Combinations (Aluminum-Clad Wood and Vinyl-Clad Wood) - are wood frames that use aluminum or vinyl on the exterior parts of the frame. This provides the aesthetic benefits of wood on the interior and the durability of aluminum and vinyl on the exterior. Awning - hinged at the top, in which the bottom of the sash swings outward. Casement - hinged window with a sash that cranks outward to the left or right. Single Hung - a window with two panels, of which only one slides within the frame. 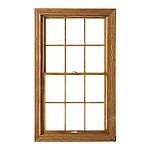 Double Hung - a window with two vertical sliding sashes in a single frame. Fixed Frame - windows that do not open. Slider - a window with two horizontal sliding sashes. Bay - three or more windows combined in which the two side windows are at an angle (30, 45 or 90 degrees) to the center window, this causes the window to project out. Bow - similar to a bay window set, but the angle is smaller so that the windows form a semicircle projection. Energy Efficiency- is typically expressed in u-values or r-values. U-values (conductance of heat) - the lower the u-value, the better the insulation. In colder climates, a u-value of 0.35 or lower is suggested. R-values (resistance to heat flow) - r-value = 1 / u-value. Typically range from 0.9 to 3.0. Glazing - refers to the glass panes of a windows. Double Glazed - two pieces of glass separated by a spacer. It is usually the minimum requirement for new windows specified by local building codes. Triple Glazed - three pieces of glass separated by spacers. Although more expensive, triple-glazed windows are appropriate for locations with extreme weather conditions, or where increased sound insulation is merited. Tempered Glass (Safety) - glass that has been strengthened by heating and quick cooling. Tempered glass will break into small pieces when it is shattered. It is code in most places for large windows less than 18 inches from the floor, near a door, or near a shower or tub. Coatings - several types of coatings are applied to the glazing (the glass) to improve energy efficiency. Low-e glazings are special coatings that reduce heat transfer through windows. The inner pane of glass is coated to reflect heat back inside the house during the winter. This coating will also slightly reflect heat back out of the house during the summer. Spectrally-selective coatings reflect the non-visible ranges light while allowing all of the visible spectrum of light in. This can reduce the heat normally transmitted through clear glass by 40% to 70%. Tinted coatings can be used to absorb solar heat into the outer panes. However, some heat will continue to pass through tinted windows. Spacers - the glass in a double or tripled paned window is held apart by spacers. Older windows use aluminum, which is a good conductor of heat and somewhat defeated the purpose of the multiple panes. Newer windows use non-conductive metal such as stainless steel or a vinyl spacer. Gas Fillings - originally the space between panes in a double-paned windows was filled with air or nitrogen. Newer windows use argon or krypton which both provide better insulation. Argon is less expensive and most effective with 1/2 inch spacers. Krypton is more expensive, but more effective when the spacers must be 1/4 or 3/8 inch thick for some external design constraint. Choose the frame material that best suits your needs. This is a trade off between cost, durability, aesthetics, and insulating value. Vinyl - look for frames that are welded together, not held together with screws (these tend to fall apart over time). Also look for a consistent color throughout the frame. Aluminum - look for ease of operations (opening, closing and locking) and good insulating value. 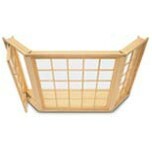 Wood - look for smooth opening and closing and tight fitting pieces. All types: Look for spacers of at least 1/2 inch and certification by the National Fenestration Rating Council. Be sure to compare manufacturer warrantees. These are good indications of the window quality.